Irish international backrow, Jordi Murphy, is unlikely to feature for Ulster during their back-to-back Guinness PRO14 games in South Africa. 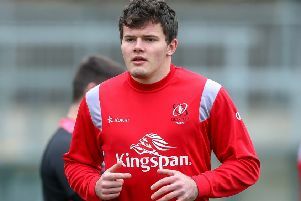 Having made his debut for Ulster in the 30-29 win over Edinburgh at Kingspan Stadium last weekend, the former Leinster star picked up an ankle injury. The ligament damage had initially ruled him out of Sunday’s game against Southern Kings but head coach Dan McFarland felt he might also miss the game against Cheetahs on September 22. It is a blow for the Irish province, however, Ulster confirmed yesterday that Jean Deysel would return from injury for the trip to his home country. Flanker Deysel and fellow backrower Clive Ross and props Tom O’Toole and Tommy O’Hagan have all recovered from injury and are available to travel. McFarland will take a 30-man squad today to South Africa, although he can look to bring others over for the second game. Given the short turnaround between the Kings and Cheetahs matches, that may well be an option he may need to call upon. “I’m comfortable with the fact we’re taking a squad that can cope with the short turnaround and the logistics,” said McFarland. “I think the difficulty comes when you leave yourselves a little thin over there, when you train as a group for a certain length of time and then at the last minute you having to bring people out there. “So I’m hoping we’ll have that we’ll have that covered but you can never say never, obviously there’s a limit on what you can do feasibly, yeah it certainly makes it difficult. Chris Henry will miss the trip to South Africa having suffered a calf strain in the Ulster ‘A’ loss to Leinster in the Celtic Cup opener. Peter Browne and Jack Owens both suffered concussions in that game and will follow the return to play protocols. Alex Thompson continues to recover from a calf injury. Meanwhile, Shelbourne Motors announced Ulster scrum-half John Cooney as its Brand Ambassador. The Irish International will link-up with one of Northern Ireland’s largest family-owned vehicle retailers to promote its range of manufacturers, as well as its new £5m complex in Newry that’s scheduled to open in 2019. Cooney had a remarkable 2017/18 debut season scoring 226 points in 25 appearances for Ulster that culminated in selection for the PRO14 Dream Team. He also named Ulster’s Player of the Year, Supporters Club Player of the Year and Rugby Writers’ Player of the Year. His outstanding form has continued into the new season with a match-winning performance against Scarlets at the Kingspan Stadium that saw him kick all of Ulster’s points in their opening PRO14 fixture. He followed this up in Ulster’s nerve-wracking 30-29 win over Edinburgh by winning the contest with the final kick of the game to rack up 20 points from a try, three conversions and three penalties. “I’m absolutely delighted that Shelbourne Motors has asked me to become their first ever official Brand Ambassador. “I’ve got to know this family run business really well and I’m hugely impressed with their excellent network of manufacturers and commitment to delivering a quality customer experience. “You can easily see why they are one of Northern Ireland’s largest family-owned vehicle retailers,” he added.